It’s nearly impossible to keep your car’s paint looking perfect when you use it every day. It seems no matter what you do, highway debris, parking lot mayhem, and the sun’s UV rays do their fair share of damage to your pride and joy. Nothing short of a trip to a professional’s paint booth seems like a viable solution to the weathered appearance of your car. Fear not! I’m going to show you some inexpensive and simple repairs that can help turn back the clock on your vehicle’s aging bodywork. Before you can start slinging paint, you have to first figure out what color of paint to use. The factory paint code for your vehicle is located inside of the driver’s door jamb or under the hood, usually on a plate placed near the firewall or radiator support. Plugging this code into a Google search will help you find the color’s name. Getting all the materials you need before you dive in can save you time and money. Armed with your vehicle’s paint code, you can find all of the needed supplies online and have it delivered to you within a few days. Your local auto parts store will have some of the more generic materials such as primer, sand paper, filler and masking tape if you find that you run out and need to get more. Shown above is everything you will need when performing a repair to your car’s plastic bumper. The total cost for everything here was around $80. There are complete “kits” you can buy from various online sources which can bundle everything and save you additional money. The materials needed for touch-up painting are slightly different than spot painting. The picture above gives you an idea of what items you will need to get a quality finish from your touch-up paint job. The total cost for everything shown here will set you back around $30, but it will last you for a quite a long time. I’ve found that paint repairs go smoother when I can isolate the body panel in question. Bumpers on some vehicles are fairly straight-forward to remove, so do some research beforehand to see if it is something you feel comfortable taking on. Leaving the bumper on the car is not the end of the world, but it may require you to do more masking off to avoid unwanted overspray on various components surrounding the repair. A 300ZX in it’s natural state. The car used to demonstrate these repairs is a Nissan 300ZX Twin Turbo, a car in which I have grown well-versed in how to disassemble. It was easier for me to just remove the bumper to conduct the repairs, so the following procedures will be shown with it off of the car. That’s looking a little rough. Plastic bumpers are great; they can take a certain amount of impact and still be able to bounce back to their original shape like nothing happened. However, sometimes that kiss with a foreign object is too great to go without leaving a mark. This mark usually comes in the form of deep gouges in the otherwise smooth surface of the bumper, often accompanied by missing paint. It’s not a great look. The first step in rectifying this eyesore is to sand the spot as smooth as possible with the 600-grit sandpaper mounted to a sanding block. The sanding block allows you to apply an equal amount of pressure over a large swath of area. This will prevent you from creating grooves in the relatively soft plastic. It’s a good idea to mask off the affected area to prevent over-sanding. Once the area is smoothed off, apply some surface cleaner to remove all of resulting debris. You can then apply a flexible epoxy filler to fill in the remaining depressions. The filler I used for this example was an easily-mixed and quick-setting two-part compound which was included in the plastic bumper repair kit I pictured earlier. After the filler has hardened, smooth the area off again with the 600-grit sand paper mounted to a sanding block. Get eye level with the work area and scan for any highs or lows and sand as needed. Any sort of raises or indents not caught at this point will become glaringly obvious once paint is applied. After you feel content with the evenness of the surface, you’re ready for paint! Before we jump into painting, let’s go over one other common plastic bumper imperfection: cracks. Looks like someone has had a go at this one before. Cracks usually occur when the bumper is subjected to a severe impact with an immovable object. In my 300ZX’s case, it was more than likely caused by running into a curb when parking. When driving low cars, you have to change your driving style considerably to prevent causing you and your car grief. Being attentive will prevent such cracks from happening. No sense in crying over spilled milk, let’s get it fixed! If someone has previously attempted to repair the crack, like was present in my case, it’s a good idea to remove all of the old body putty that remains. Break out the Dremel tool and go to town removing the bulk of it. Afterwards, go over it with sand paper. You want to create a nicely scored surface. Following the sanding, wipe down the area with surface cleaner. With the area cleaned, apply a base epoxy layer that thoroughly bridges the crack. Immediately following the epoxy application, lay down the mesh screen, which is included in the bumper repair kit, over the epoxy. When doing this, lightly press the mesh screen into the epoxy so that it becomes embedded. Finally, slather a final layer of epoxy over the mesh screen so that it is completely covered. Let the repair sit for about an hour, after which you will see that the crack is gone and strength is returned to the area. That’s all it takes! 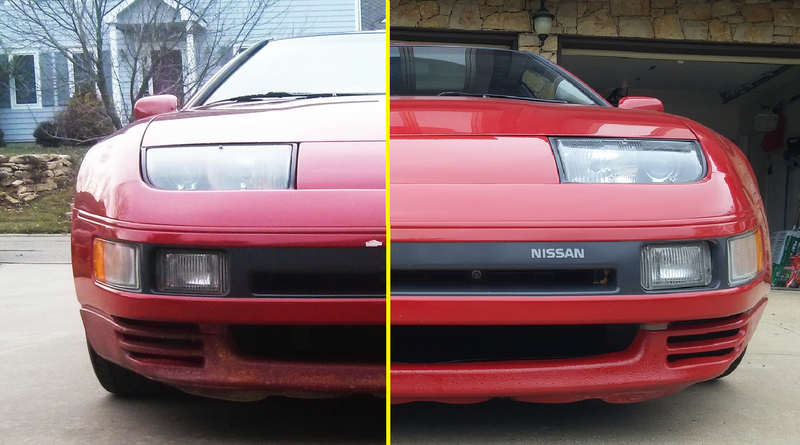 Spot painting is where you make the real difference in the appearance of your car. Filling in defects in your bumper is great and all, but if paint is missing, it’s not going to look good no matter what. Consequently, this is the hardest part of the cosmetic repair process. If you get too heavy with the paint you’ll end up with a drippy mess; too light and you might have a grainy textured finish. It is all about finding that happy medium. When you are using aerosol cans like I am demonstrating with, there is a certain amount of practice mixed with a generous helping of luck to make the outcome look good. You must believe that you can do it! Before you even think about spraying paint, you must first mask off your painting area. Nothing says “crap job” like overspray on stuff that shouldn’t be painted. You want to find sharp, defined edges to mask against so you can reduce the amount of paint blending required while also keeping the area that needs painted a manageable-sized space. In my example, I had to increase the boundaries of my masked area to allow for blending of new paint with old paint. I wasn’t interested in painting the whole bumper, just one spot of it, so blending the paint was a necessity. After masking the area, do a thorough wipe down with surface cleaner. Then, hit the area with a light coat of primer spray. Concentrate the spray pattern over the defect area and do not expand too far over that. You don’t want to paint more than you have to! Once the defect is completely masked by the primer, which may take two or more coats, it is time to sand the primer surface smooth. Use 600-grit sand paper mounted to a sanding block to accomplish this. Go light on the sanding as it won’t take much pressure to blow right on through the primer layer. You’re looking for a glass-smooth finish. Once sanded, do another wipe down of the area with surface cleaner. The next step is to apply the color coat. Begin with a light spray over the primer area to see how the color lays atop the surface. Once you get a good feel for how the paint spreads, continue to cover the area until none of the primer is visible. This may take three or four coats of the color spray before the fullness of the color is apparent on the surface. In my example, I could not simply paint the entire masked area as it would leave nasty paint edges where the masking tape was. So, I needed to “blend” inside of my masked area to create a seamless transition from new paint to old paint. Once the color coat is on, the final step in the spot paint process is to apply the clear coat. The clear coat not only gives the paint a glossy finish, but it also helps protect the paint against the elements and sun rays. When applying the clear coat, start off with a light dusting to observe how it goes on. Once you have a feel for the volume of spray that the aerosol can dispenses, go ahead and proceed with two or three heavy coats. I say “heavy” because I have found that if you are too light with the clear coat, you can get an undesired grainy finish that is anything but glossy. You want to be applying an amount that is just short of running. As with the color coat, you will want to blend with the old paint so that you are not left with hard paint edges caused by the masking tape. After letting the final application of clear coat dry, remove the masking tape. It is important to be gentle while removing the masking tape because quickly ripping it off can create a frayed edge in the fresh paint. Not good. The final cosmetic repair that I will go over is the least invasive and offers good results with a minimal amount of risk of screwing up. Chipped paint is a rite of passage for highway driving and there isn’t a whole lot that you can do to fully prevent these chips from occurring. Rocks flinging off of tire treads or gravel falling out of a dump truck are just some of the typical situations you will undoubtedly encounter. Unfortunately the paint on the front of your vehicle has to bear the brunt of the impact with this foreign debris. Touch up paint can help you resolve these spotty imperfections. The first step in the touch up repair process is to clean the rock chip with surface cleaner. Apply some cleaner to a paper towel and wipe down the affected area. With the area cleaned of dirt and oil, it is time to apply the paint. Shake the bottle of paint well, stir it if necessary, and then dip the fine bristle brush into the paint so that the upper portion of the brush is covered. You don’t want to go overboard with the amount of paint on the brush; you want to allow for a controlled transfer of paint from the brush to the car’s body. Gently dab the rock chip with the brush – it’s OK to have it “glob” onto the surface. This is because the next step is to “level” the paint glob. While the paint is still wet, apply some paint leveling solvent to a paper towel and lightly wipe back and forth over the touched up spot. You will see that this removes the “glob” and leaves the touch up paint flush with the original paint surface. After those few steps you will have successfully touched up one rock chip. It is tedious, especially if you have a lot of chips to deal with, but the time spent doing this correctly will pay you back with great looking results. Paint work can seem like an overwhelming task when you are first faced with it. However, following the simple guidelines above will help see you through to success. We aren’t all chasing a concourse-perfect paint job, nor do we want to cough up the money for one. This is a car you drive, and as such, body imperfections will be an on-going, yet hopeful, battle. Maintaining your car’s appearance with simple DIY cosmetic repairs can be an inexpensive venture that can reward you with impressive, long-lasting results. Go on, give it a shot!